Amazon has a great deal today on the Barbie Glam Vacation House! This will make a great Holiday gift for a Barbie fan in your house! Just $22.90 from $39.99! Like all Amazon prices, who knows when the price will go back up, so scoop this up NOW! CrockPot Damask Pattern only $12.74 – HOT! 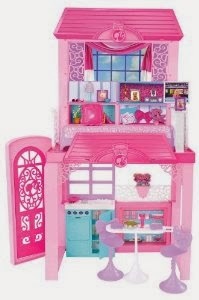 Doll Play Kitchen only $24.78 ($129.99) on Amazon today! Great Deal on R/C Helicopters on Amazon! Fisher-Price Jake & The Neverland Pirates Hook’s Battle Boat – Only $7.79 today on Amazon!